We need to understand that our modern day convenience of single-use plastic bags and other single-use items seem free, but it actually comes at a very high cost to our health and to our environment,” says Sharon. 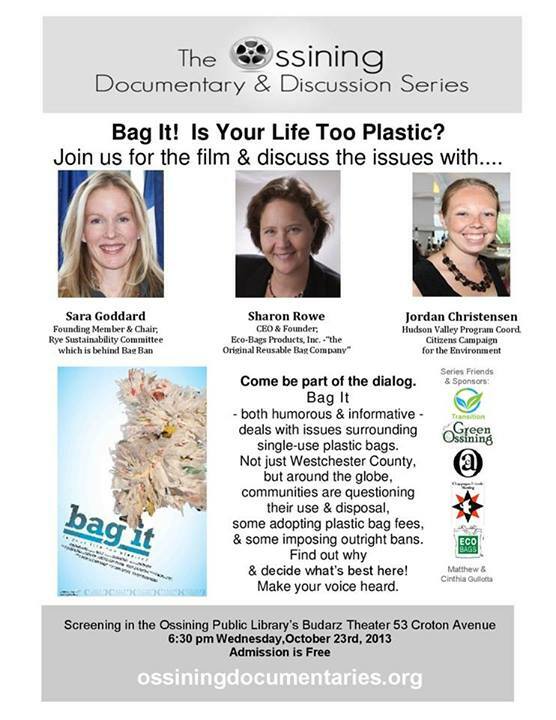 On Wednesday evening, October 23rd, the Ossining Documentary & Discussion Series will screen the film, “Bag It,’ which opens with Sharon’s query and asks, “is your life too plastic?” The film humorously and informatively explores the issues surrounding single-use plastic shopping bags and their environmental impact. With plastic bag bans and fees being debated both locally and globally, the film is incredibly relevant today. The event is free and open to the public. It will be held at the Ossining Public Library’s Budarz Theatre and everyone is invited to stay after the movie for a lively discussion. The Theatre opens at 6:15 and the film starts at 6:30. Join us on Wednesday with Sharon, who is featured in the film and is a guest panelist for the event, and judge: Is your life too plastic?